Before you juice … | Indestructible Ideas! I called today, ‘Green Tuesday’! After several weeks of debating and researching, my family purchased our first juicer. Working on our documentary has prompted me to make some life style changes. One of the changes is to increase the amount of raw food we are eating as a family. Before I was able to start the change, I needed to do some substantial research to make certain I was investing into the right product to help us reach our goal to be a healthier family. After meeting with the Gerson Institute this past week I was ready to commit to the purchase and spent the weekend reading reviews and looking at comparison charts for the best juicer I could afford on my grad student budget. When I first became interested in juicing, I was pretty clueless about the type of juicer I needed, let alone how it works. There are basically two types of juicers, masticating (slow juicers) and centrifugal juicers (fast juicers). Centrifugal juicers use very high speeds to make pulp and use centrifugal force to juice by grating the fruits and vegetables. Masticating juicers use a system of augurs or gears to slowly revolve to squeeze juice from vegetables and fruits. Centrifugal juicers are noisy, where mastication juicers are much more quiet. The yield is also important to consider, if you are looking at juicing green and leafy vegetables such as spinach, wheatgrass, parsley, lettuce and other herbs you will want to focus your search on a masticating juicer as they score higher in terms of yield. If you are looking for a quick juice it is suggested that the centrifugal juicer might be one for you, however, the most amount of fresh quality juice will come from a masticating juicer. First, let me break down the different types of masticating juicers on the market today. I am going to explain two categories of juicers; juicers for cancer treatment, and those for non-cancer treatment. The Gerson Institute suggests two models of juicers, which are required for Gerson Therapy for cancer. The juicers, which are required for the therapy, have a two-step machine. This includes a grinder and a hydraulic press. The first component of the juicer grinds the vegetables into a very fine pulp. The second step is a hydraulic press, which presses the juice from the pulp of the vegetable by pressing it under extreme pressure. During this process, the produce is kept from electricity and heat, which allows for the healing enzymes to remain in the juice. The Gerson Institute recommends two juicers that fit these criteria. The first is the Norwalk Juicer. Please click Norwalk Juicer to see the video. While the Norwalk Juicer has been found to be the most effective grind and press on the market, it retails $2,400 for new unit. It is important to point out the cost saving benefits of using a quality juicer. The better the juicer, the more quality, nutritious juice you will be able to extract, which can actually save you money in the long run. An alternative to the Norwalk is the Champion juicer. The Champion juicer includes a grinder, you will still need to purchase a separate machine for the hydraulic press to squeeze the juice from the pulp it retails about $600 for the juicer and the hydraulic pump. If you are looking for a juicer for treating non-malignant conditions the price drops substantially. The recommended juicers are called Masticating juicers. These juicers use a slow method to extract a sufficient amount of juice and to preserve enzyme activity. 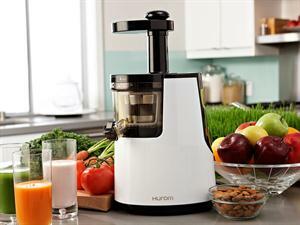 I ended up going with the Hurom Slow Juicer and Smoothie maker. I wanted to have the versatility of having two machines in one. I also really liked the fact that I could adjust the amount of pulp. As a mom, I wanted to be able to appease the entire family, this machine allows my husband and I to juice, while also giving us a fun family activity in making health smoothies, baby food and even homemade ice-cream. I also wanted a juicer that was more vertical than horizontal to save on counter space. While the purchase price was a little more than I had intended to buy, I knew it would be used more if it had more options, the juicer also comes with a 10-year warranty. I have found it to be very quiet, which is great as my husband starts juicing about 5am. The clean up is really simple as well. My partner Gino raves about his Omega juicer, and his knowledge and experience with juicing is what really motivated me to invest in a juicer. The Omega Juicer has gotten great reviews as well and can be purchased from Amazon, Target, and Bed, Bath and Beyond. Omega carries 15 different types of masticating juicers, with prices ranging from $229-$450. Omega also has both horizontal and vertical juicers and they have a great tool on their website to compare Omega products. As we continue to work on the post-production of our documentary, we encourage everyone to make steps towards healthy lifestyle changes. We welcome any juicer questions. Look forward to our next blog post were we will share some additional tips on juicing and some juicing recipes along with some organic gardening tips. ← Think Before you Pink!